Pittsburgh’s still the best place to celebrate St. Patrick’s Day. That’s according to Niche.com, which places the Burg ahead of Boston (the city that held its first St. Patrick’s Day Parade in 1737) and Chicago (where they dye the Chicago River green in the saint’s honor). Pittsburgh’s Parade Day traditions might be younger than Boston’s, and our rivers might not ever go green, but Pittsburgh is still the best place to be for mid-March celebrations … and the place to be in Pittsburgh (at least for my money) is Riley’s Pour House. 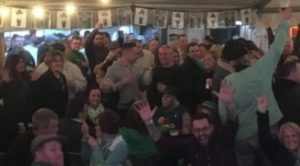 This post is a follow-up to Parade Day @ Riley’s: Just the Beginning, which I managed to post between a couple of marathon gigs on Parade Day Weekend. 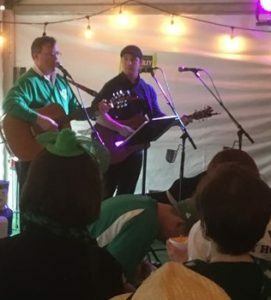 I intended to be as timely with this post, but the St. Pat’s performance schedule proved to be even more demanding than the one on Parade Day. We played ten hours over two days, dividing our time between the pub stage and the tent. Now, after a week, I’m finally ready to do some blogging. The St. Pat’s weekend got rolling on a snowy Friday afternoon, but the weather didn’t deter the crowd. 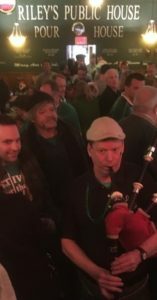 By evening, the party was in high gear as piper John Walsh (above) did his traditional march through the pub. We took the stage at 5:00, and before long the place was at capacity. At once point, I had to pause and snap a picture (left). I can’t prove it, but I sense it was the best party this side of Dublin. At 8:00, Mark Guiser took over the pavilion stage while bassist Duane Davis joined me for two more sets inside the pub. Then, the next night, we did it all again. I’ve been playing March shows like this for years. They’re fun but demanding, and over time I’ve learned a thing or two about pacing the sets so as not to run out of steam. But this year I decided it was time to purchase some new gear to ease the strain of back-to-back performances. I offer the following as a bit of musician shoptalk. FYI. First, I opted to play some of these shows with a Martin 000×1 rather than my usual full-size Guild. 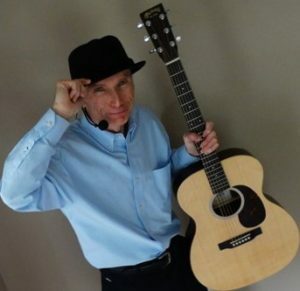 I love my all-wood dreadnought, but the Martin — with its smaller design and laminated back and sides — makes standing and playing a lot easier, especially during the final sets. Second, I fashioned a mic-hat that provided more freedom on stage. It might seem like a small thing, but the wider range of movement seemed to keep me limber as the night wore on. That’s the mic-hat (and the new Martin) on the right. The microphone, a Shure WH20XLR, comes with a wire head brace that looked like it might get uncomfortable fast. The hat seemed like a good way to provide padding while keeping the thing in place. Headgear for a 21st-century scop. What do you think? Maybe I should market these. Images © The 21st-Century Scop, 2017. This entry was posted on Saturday, March 25th, 2017 at 7:41 pm and is filed under 21st-Century Scop, Uncategorized. You can follow any responses to this entry through the RSS 2.0 feed. You can leave a response or trackback from your own site. Powered by WordPress and delivered in 0.522 seconds using 46 queries.